You've been there, I've been there. Let's not dwell. The good thing about arguing with feminists is that it can occasionally force you to go away & do the research for yourself. Not that it will alter their opinion even one little bit, of course, when you present it to them, but it's good to know of what you are speaking - the evidence, the stats, the facts & the figures behind the position that you hold - rather than simply singing along with the words like everyone else. As an example: recently I was responding to a feminist online & used the well-known (to regular readers) figure of 90% of the homeless being men. She questioned it, & I realized that, although I'd used that particular figure a bunch of times I'd never tracked it to its source before. So I took a look & thought I would list my findings here as a resource for those interested. In the UK both the Scottish Government's Homelessness Monitoring Group's 2004 First Report To Scottish Ministers & the official homelessness statistics from CRISIS 2006 (source: p.29) give the figure as 80-90%. In North America two sources from the year 2000, Homelessness: The Making and Unmaking of a Crisis by Jack Layton & Barbara Murphy's On The Street: How We Created Homelessness give the figure as 70-90%. There seems to be a little more variation in the U.S figures generally, I would imagine stemming from that country's much larger size, & studies being done in different states rather than nationally. Another source: “Data collected for the 2004 U.S. Conference of Mayors survey showed that in almost all cities surveyed, single males greatly outnumbered single females among the homeless. Single males were most overrepresented in Nashville, Tennessee (79% of the homeless), followed closely by Santa Monica, California (72%), Miami, Florida (70%), and San Francisco, California (69%)” (source: Libraryindex.com). This is a very high percentage but lower than 90%. However, this study refers only to single males: if males in other groups (married men & children) also outnumber women then the total figure of male homelessness would be noticably higher. A commonly stated figure which pops up repeatedly when googling about this is 68%. Still, obviously, a great inequality, but that number originates with the U.S. Department of Housing and Urban Development & refers to the number of homeless ‘clients’ - i.e the percentage currently being worked with & sheltered by that organization. There are other factors which make it hard to get a definitive answer: a father with children, or even wife & children, often comes under the heading of ‘families’ - which tends to be classed seperately - so it muddies the water even further. Wikipedia says there are 41% single males to 14% single females. It also says “In 2008 in one sample, women represented 26% of the respondents surveyed” [my italics], which obviously only relates to whoever filled the survey in but still, would presumably mean that 74% of those were male. My point in listing these differing reports is simply to say we can't know for sure what exact percentage of the world's homeless population is male. There is no single statistic: there will be considerable variation between different countries & even areas within those countries. And it's a big world, but I haven't been able to find any figure anywhere that says men are less than two-thirds of the homeless, & the generally accepted government & charity organization estimates, as I stated at the beginning, do seem to be generally in the region of 80 - 90%. In my own personal experience (& most likely yours too) living in different cities in England the last 20 years or more, easily 9 out of 10 people I see out on the streets are men. In fact I can’t remember the last time I saw a female beggar, though I always see at least five or six men panhandling every time I cycle into town. So there we go: doesn't that feel better? To actually know what you're talking about? It's a good feeling. I recommend it. Men comprise an inordinate share of the homeless population for various reasons. One is that psychological tests demonstrate that men show more variability in intelligence and other abilities than do women. this means a wider distribution with more men at either end of the bell curve more male geniuses, more male idiots). these less capable men are more likely to be unemployed, especially in an economic downturn. The second reason has to do with the misandry present in society. governments have always been inclined to provide assistance to "families" with children. The problem is that many of these assistance programs are geared towards seperating men from their families. It is far easier for a single mother to obtain benefits if she is not living with the father. A single man is often deemed capable of working while a single motehr with children is not. When men are eligible for benefits on their own, those benefits are typically below subsistence levels and of shorter duration than those provided to single mothers. Often, a man has to mental health issues, be a recovering addict, just out of prison, or recently unemployed to be considered eligible. Another problem is child support. When a single mother applies for aid, the state demands to know who the father is so that he can be made to pay for the benefit. It doesn't matter whether he is unemployed, a recovering addict, just out of prison, or has mental health issues. For low functioning men, this can be enough to drive them into homelessness while providing food, clothing, and shelter for the mother of his children who won't work. It is also far easier for a woman who doesn't wish to work to find a man who will support her than it is for a nonworking man to find such a woman. There would likely be more men in prison anyways because there are more low functioning men. But this inequity in provision of services undoubtedly contributes to the disproportionate numbers. Very interesting. It's true, it is easier for women to get assistance. Not just from the State, but from churches and people in general. I knew some homeless guys who hung out in the alley behind a restaurant I worked in. I would bring them food when we had extra and they were always grateful. But it seemed that they didn't really want to do anything besides sit around the alley and drink cheap beer. They weren't mentally unstable, they were possibly drug users (though I doubt it given the way they eat) and there ARE programs that will give them a hot meal, clean clothes and help them find work if they want it. I wonder if maybe they weren't just opting out of the rat race and playing the survival game instead or rather, choosing to remain homeless. I think what happens is that more women take advantage of assistance programs because most women aren't willing to live on the streets for very long, but very willing to accept handouts. "In 2008 in one sample, women represented 26% of the respondents surveyed” [my italics], which obviously only relates to whoever filled the survey in but still, would presumably mean that 74% of those were male." Perhaps not, a few may be children. That point aside I'm really impressed with this piece. Excellent writing and research. Counting people sleeping rough on the street does not provide an accurate picture of who is & who isn't homeless. All it really tells us is that society is more tolerant of male rough sleepers. Homelessness takes many forms...you don't see as many females as males dossing down on the pavement, but this is no indicator of status. People in squats, b&b's, shelters, floors, hostels, etc. 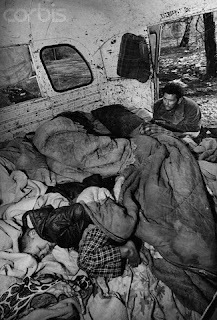 are all homeless. These people are largely victims of familial breakdown, common to both sexes. In fact, I'd argue that those men you see on the street are there because they are better able to survive on the street. The majority of homeless may well be male, but why play the figures game? I've worked for two homeless charities...there IS help for men who are prepared to accept it. The problem may just be that men are unwilling to accept help. What value is there in turning this human problem into a gender specific one? Because such a great disparity IS gendered, & indicative of a misandric society: If 90% of the people sleeping rough were female, it would be perceived as a crisis, there would be an outcry & steps would be taken immediately to address & counteract it. The women would be seen exclusively as victims, in desperate need of our help - no-one would dare suggest the women only have themselves to blame. Whereas when the same thing happens to men - as you have just demonstrated - society looks for ways to blame men, saying they are simply 'unwilling to accept help', & anyway, should be 'better able to survive on the street'. Homelessness is their own fault. It's of interest also because it disproves feminist patriarchal theory, which will go through extraordinary contortions to avoid seeing that, although a handful of men may well be at the 'top' of society, countless men are also at the very very bottom, disposable utilities without feelings, for which no support or empathy is necessary or forthcoming. Origins Of The Term "Politically Correct"